With more than 900,000 books sold in her writing career, Joyce Rupp remains a leading voice in women’s spirituality. 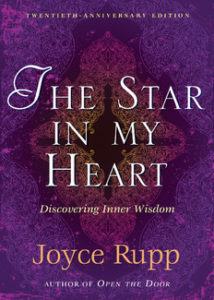 Now available in a new edition with an updated preface, The Star in My Heart guides readers toward a warmly personal understanding of Sophia, the feminine personification of wisdom. Rupp employs visual metaphors—often involving the natural world—for each chapter to reveal how Sophia guides us through the inner processes of spiritual growth. Each chapter includes summary points, ideas for meditation and journal writing, and reflection questions ideal for group discussion.